The Royal is eastern Ontario’s largest and one of Canada’s foremost mental health care and academic health sciences centres. Our mandate is simple: to get more people living with mental illness into recovery faster. The Royal combines the delivery of specialized mental health care, advocacy, research and education to transform the lives of people with complex and treatment- resistant mental illness. At The Royal, care informs research and research informs care. We use cutting-edge research platforms –including brain imaging and translational neuroscience – all of which promise to improve both our understanding and treatment of mental illness. Our reputation as an innovative and effective mental health leader, along with the establishment of our Brain Imaging Centre, has enabled us to attract some of the brightest research minds from around the world. health challenge our society faces today. With every affected individual displaying symptoms that are unique to them, successful diagnosis and treatment rates are just too low. By supporting The Royal, you are a part of a revolution in mental health research and patient care. Together, we can shift the landscape of mental health in our community and in Canada. Better research means better care. We are only just beginning this game-changing journey. 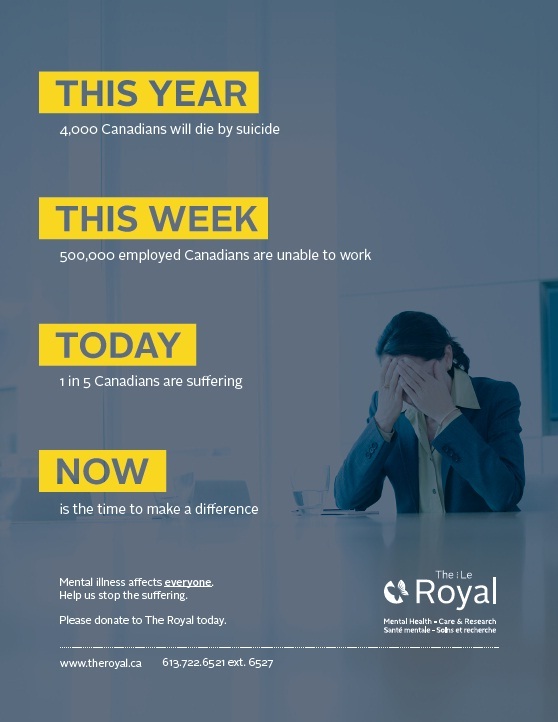 This week, 500,000 employed Canadians are unable to work due to a mental illness. Mental illness causes more lost work days than any other chronic condition. The estimated annual cost of mental health disorders to the Canadian economy is a staggering $51 billion. Mental illnesses and neurological diseases have moved to the forefront of Canadian public attention, reflecting increasing recognition of their far-reaching effects on the lives of Canadians. With the community’s philanthropic support, The Royal is becoming a centre of excellence in the area of brain imaging and depression research. We will do this through innovative and effective treatments and by identifying new methodologies for prevention and early diagnosis. Dr. Pierre Blier and Dr. Georg Northoff, research unit directors at The Royal’s Institute of Mental Health Research (IMHR) are launching a collaborative study using functional magnetic resonance imaging (fMRI) and electroencephalography (EEG). The goal of this study is to allow our researchers to identify the brain circuits that contribute to an increased risk for suicide. Gifts to The Royal can be directed to patient care, research, education or the most urgent priorities of the hospital. Help us transform mental health in our community and beyond. Donate. Get involved. Become a leader for mental health. Now is the time to make a difference. Left to Right: Dr. Georg Northoff, Director of the Mind, Brain Imaging & Neuroethics Research Unit at The Royal’s IMHR; Dr. Zul Merali, President & CEO of The Royal’s IMHR and Dr. Pierre Blier, Director of the Mood Disorders Clinical Research Unit at The Royal’s IMHR. The Royal’s Gala is one of Ottawa’s premier social events, with more than 550 leaders in the corporate, political and non-profit sectors. As a corporate sponsor you will receive prominent company name/logo visibility in advertisements, newsletters and social medical, reaching thousands of employees, businesses and individual donors. If your company is interested in becoming a sponsor for our 2018 Inspiration Awards Gala, please contact us at 613.722.5261 x 6707 to learn about the varying sponsorship levels. In 2010, former NHL hockey player Luke Richardson and Stephanie Richardson lost their 14 year-old daughter Daron to suicide. The family decided to turn their very private pain into a public call-to-action. Do It For Daron (D.I.F.D.) was created at The Royal to support youth mental health awareness, education, and research. The movement inspired dialogue in the community, bringing hope to thousands of youth and continues to help raise funds to support many important youth mental health initiatives, such as the Is It Just Me? program, and the HealthyMinds and BeGameReady online applications. Leigh Harris, President and Executive Consultant, Halo Management Consulting Inc.
Douglas A. S. Rankin, Senior Vice President- Finance, Modern Niagara Group Inc.